Kazakhstan has been run by Nazarbayev for the entirety of the period since its emergence as an independent nation in 1991 after the fall of the Soviet Union. Kazakh leader Nursultan Nazarbayev on Tuesday made headlines globally, after he announced the end of his 30-year rule over the energy-rich Central Asian country, leaving many puzzled about its future. Kazakhstan has been run by Nazarbayev for the entirety of the period since its emergence as an independent nation in 1991 after the fall of the Soviet Union. For his forward-looking outlook and deft manoeuvring of the country’s foreign policy, Nazarbayev has received acclaim from several quarters; a feat hitherto unaccomplished by any of his autocratic peers in the region. Under Nazarbayev’s leadership, Kazakhstan developed significantly: from a Soviet outpost used for nuclear experiments, to becoming an upper-middle income nation today. The 78-year-old ruler has been credited with harvesting the country’s untapped oil reserves and rare earth metals, opening this important sector to multi-billion dollar foreign investments. Nazarbayev also kick-started extensive economic reforms. The new-found wealth was used for financing welfare programs, including an initiative to send students abroad to study. Nazarbayev is also praised for nurturing strong relations with the US, Russia, and China, without becoming hostage to the conflicting interests of these powers. The US uses Kazakh territory as a transit for moving supplies to Afghanistan, and American companies like Chevron have deep investments in the energy sector here. Nazarbayev is also seen favourably because of his unflinching commitment to the Nunn-Lugar Program, under which Kazakhstan destroyed its entire Soviet-era nuclear arsenal. As regards Russia, President Putin is known to consider Nazarbayev as a key ally, with Kazakhstan being Russia’s largest trade partner. Kazakhstan is also an indispensable part of China’s Belt and Road project, being its geographic link to European markets. Under Nazarbayev’s rule, the country has maintained a strict policy of religious tolerance, helping maintain peace between its majority Muslim community and the large ethnic Russian and Ukrainian minority. Kazakhstan under Nazarbayev has been criticized for hindering the development of political freedoms. Elections, although conducted, have been discredited the world over for their irregularities. In the last election in 2015, Nazarbayev claims to have won with 97.7% of the vote, from a turnout of 95%. The country also lacks an independent judiciary, and mainstream political opposition is non-existent. While political opponents and journalists are often jailed, dissent is generally tolerated as long as it is of a non-threatening nature. Unlike elsewhere in the region, cruel methods for curbing dissent are discouraged, earning Nazarbayev the moniker ‘soft autocrat’. The country also grapples with vast income disparity, with Nazarbayev’s family and inner circle enjoying access to key resources; a characteristic feature among post-Soviet nations. Nazarbayev is also responsible for developing a personality cult, giving himself the title “Father of the Nation”, and building a museum mythologizing himself. It is believed that Nazarbayev intends to ensure a peaceful transition to a successor who would continue his political and diplomatic legacy. The leader was particularly rattled by the chaotic nature of succession in Uzbekistan after its autocratic leader Islam Karimov died while in office in 2016. His resignation notwithstanding, Nazarbayev retains effective control of the nation, by continuing as leader of its ruling Nur Otan party, while also being in charge of its high-power Security Council. Although the presidency has been temporarily passed on to close confidant Kassym Tokayev, many believe that his daughter Dariga Nazarbayeva would succeed after the April 2020 elections. Kazakhstan and India are known to have shared a close cultural bond from the Saka era, all through the Delhi Sultanate and the Mughal Empire, when the countries were linked by the Great Silk Route. India is known to have sent its missionaries to spread Buddhism in Central Asia while importing Sufism from there. There was an impasse in this relationship, however, when India was under British rule. This changed in 1947, when India developed formidable relations with the Soviet Union. The Soviet leadership in turn, allowed Indian diplomats to forge relations with the leadership in the Central Asian republics under their control, including in Kazakhstan. Nazarbayev, a steelworker who rose through the Communist Party ranks, was already in charge of Kazakhstan by 1989, two years before Soviet disintegration. 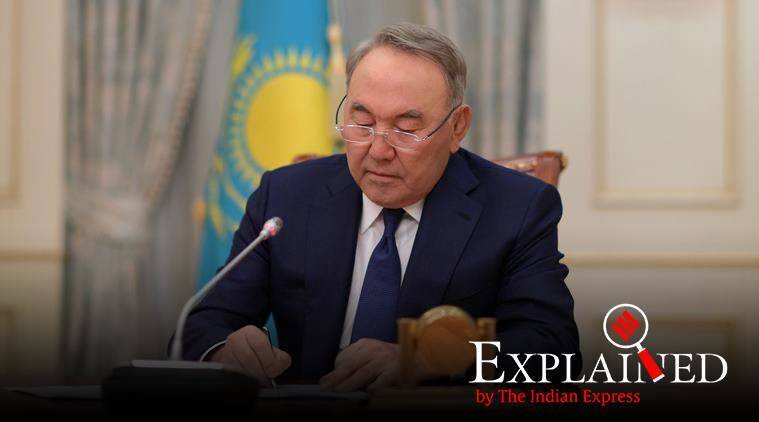 India being one of the first countries to recognize Kazakh independence, Nazarbayev returned the favour by making New Delhi the destination of his first foreign visit outside the CIS sphere in 1992. Over the years, India and Kazakhstan developed a strategic alliance, and Nazarbayev became the first leader from the region to attend the Republic Day parade as chief guest in 2009. In 2013, a five-nation hydrocarbon pipeline was suggested to help connect the two nations. While crude remains India’s dominant import, Kazakhstan continues to buy Indian pharmaceuticals and tea. A greater cooperation is now expected, given Kazakh plans to diversify their petroleum-dependent economy. Because Nazarbayev still maintains effective control over the country’s affairs, and is expected to appoint a successor with similar ideological moorings, the Indo-Kazakh bonhomie is expected to continue without much turbulence. 2 Brexit: What will happen in the British parliament today? 3 Explained: Robert Mueller says no collusion. What is next for Donald Trump?